Description: Join the Heart of Peoria Catholic Community for an anointing service at St. Joseph Church 103 Richard Pryor Place in Peoria. Service will take place after the 4pm Mass. Description: Candlelight dinner at St. Joseph Church Hall 103 Richard Pryor Place, Peoria. Description: The Vigil Mass for the Immaculate Conception at St. Joseph 103 Richard Pryor Place. Description: Join Bishop Daniel R. Jenky, CSC for Mass in honor of Our Lady of Guadalupe. Description: St. Anthony Camerata Chorale Festival Chorus will present a Christmas Concert at St. Mary's Cathedral 607 NE Madison Ave., Peoria, IL. 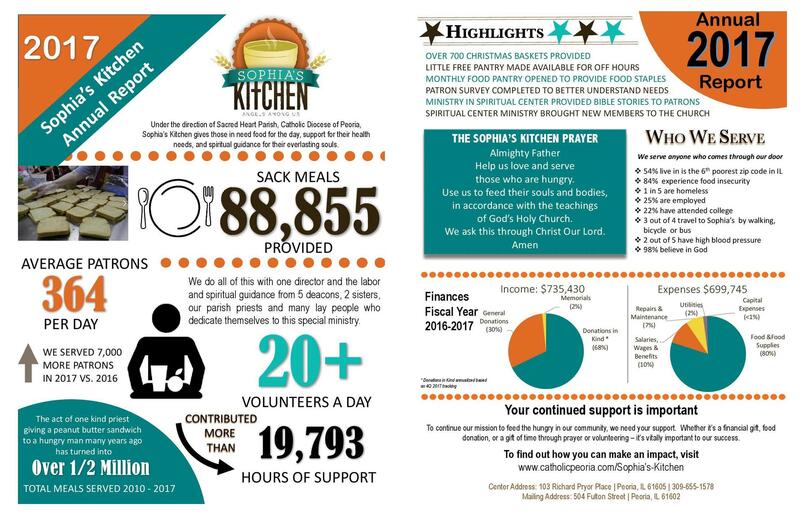 Admission is a non-parishable food item for Sophia's Kitchen. Description: Christmas Eve Mass at Sacred Heart 504 Fulton Street, Peoria. Join the Heart of Peoria Catholic Community for an anointing service at St. Joseph Church 103 Richard Pryor Place in Peoria. Service will take place after the 4pm Mass. Candlelight dinner at St. Joseph Church Hall 103 Richard Pryor Place, Peoria. The Vigil Mass for the Immaculate Conception at St. Joseph 103 Richard Pryor Place. Join Bishop Daniel R. Jenky, CSC for Mass in honor of Our Lady of Guadalupe. St. Anthony Camerata Chorale Festival Chorus will present a Christmas Concert at St. Mary's Cathedral 607 NE Madison Ave., Peoria, IL. Admission is a non-parishable food item for Sophia's Kitchen. Christmas Eve Mass at Sacred Heart 504 Fulton Street, Peoria.